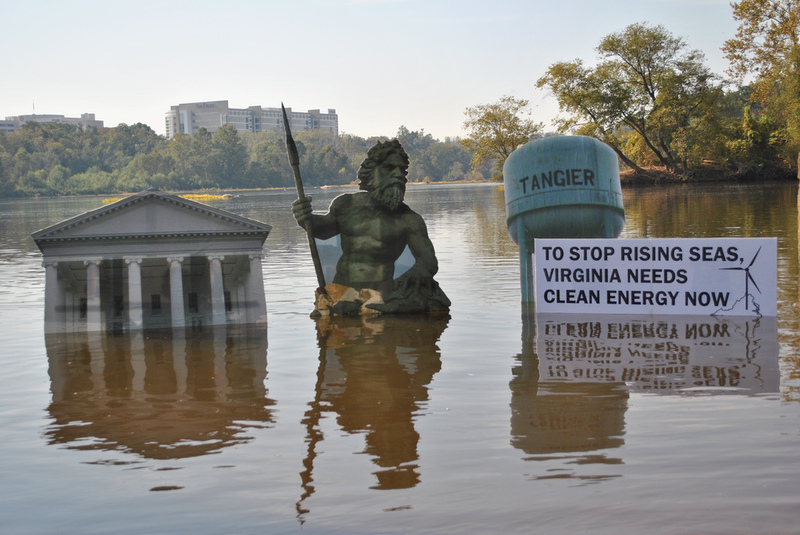 Using the three images above and your own knowledge, explain why coastlines around the world are under threat. Again, record your thoughts on the worksheet. Objective: To find out how waves shape the coastline. The coast is the name given to the zone where the land meets the sea/ocean. Coasts are shaped by the sea and the action of waves. 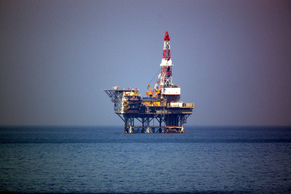 The processes that take place are erosion, transportation and deposition. 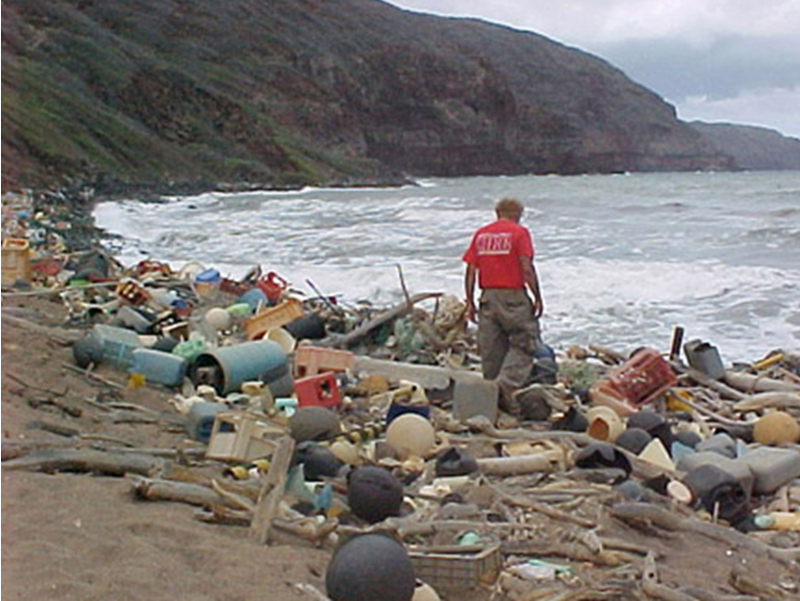 The power of waves is one of the most significant forces of coastal change. Waves are created by wind blowing over the surface of the sea. As the wind blows over the sea, friction is created - producing a swell in the water. 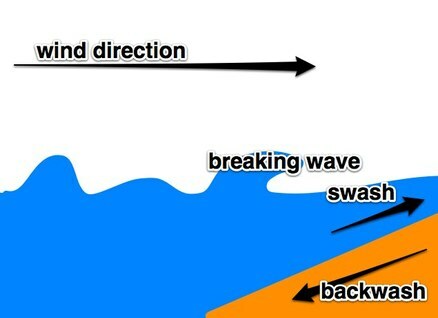 The energy of the wind causes water particles to rotate inside the swell and this moves the wave forward. Task 1 - Click on the diagram to the right hand side to enlarge. Make a sketch of this in your workbook and label accordingly. Add an arrow to represent fetch too. Task 2 - Now watch the first 2.15 of the YouTube video above to reinforce what you have just learnt. Task 3 - Mix & Match Match the correct keyword to definition from the list underneath. Use your highlighter pen on each key word as they are really important for your exam. The top of the wave. The low area in between two waves. The distance between two crests or two troughs. The distance between the crest and the trough. The number of waves per minute. The speed that a wave is traveling. It is influenced by the wind, fetch and depth of water. The movement of water and load up the beach. The movement of water and load back down the beach. Stop Check! - Do you understand swash & backwash? - Study the diagram above and watch the 12 second YouTube clip. Add a 30 second diagram to your book to help you to remember. Task 4 - Make notes on destructive & constructive waves and create a sketch diagram to show the differences between the two types. i. Watch the cliff collapse video in Cornwall, UK, to the right. This happens all the time around the world - the sea wins! It's not always caught on camera though. 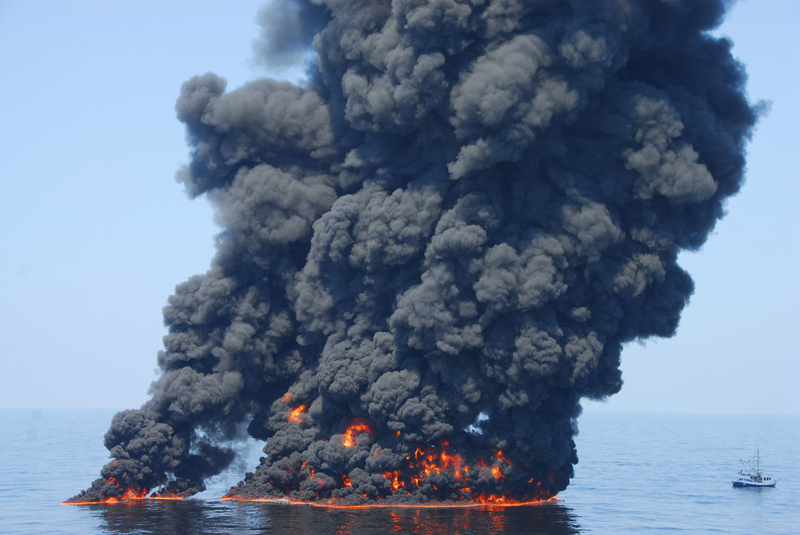 This has happened as a result of a number of erosional processes. We are going to learn about these next. ii. Complete the worksheet to the right by using the information in this section. Hydraulic Pressure: This is when sea water and air get trapped in cracks. The increasing pressure of the water and air cause the rocks to crack. 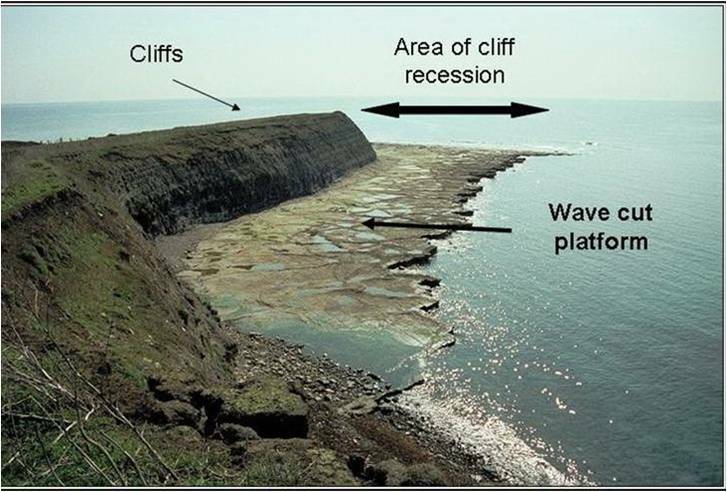 Corrasion (abrasion): Rocks been thrown into the cliffs by waves and breaking off bits of the cliff. Corrosion (solution): The slight acidity of sea water causing bits of the cliff to dissolve. Attrition: Rocks, sand and stones being thrown into each other by the sea current and waves. Task 6 - Watch the iGCSE video hosted by someone familiar (to the right). What type of erosion can you see evidence of? Take a screen shot of part of the video, crop and annotate with key features. Objective: To discover how erosion causes different coastal features. Bays and headlands are formed in a very similar way to rapids (rivers topic). They are formed when you get alternate layers of hard and soft rock. The sea is able to erode the soft rock a lot quicker than the hard rock making a bay. The harder rock forms a headland. An indented area of land normally found between two headlands. Bays are usually more sheltered so there is less erosive power, meaning you often find beaches in bays. A piece of land that sticks out into the sea. Waves refract around headlands so they experience a lot of erosion forming features like arches and stacks (see below). Wave cut platforms are made in a similar ways to waterfalls and gorges (rivers topic). At high tide the power of the sea attacks and erodes the bottom of the cliff. Over time this erosion creates a wave cut notch (basically an eroded hole at the bottom of the cliff). As the wave cut notch gets bigger, the weight of rock above the notch gets greater. Eventually the cliff can not support its own weight and it collapses. The process then starts again, with the erosion of the sea making a new wave cut notch. As the process continues the cliff starts to move backwards (retreat). Because the cliff is moving backwards a wave cut platform (an expanse of bare rock) is created. Wave cut platforms are only visible at low tide. Task 2 - Make a sketch of the image above right. Annotate all the main features using the description above. Add some colour to bring the diagram to life. Click the diagram to make it bigger. 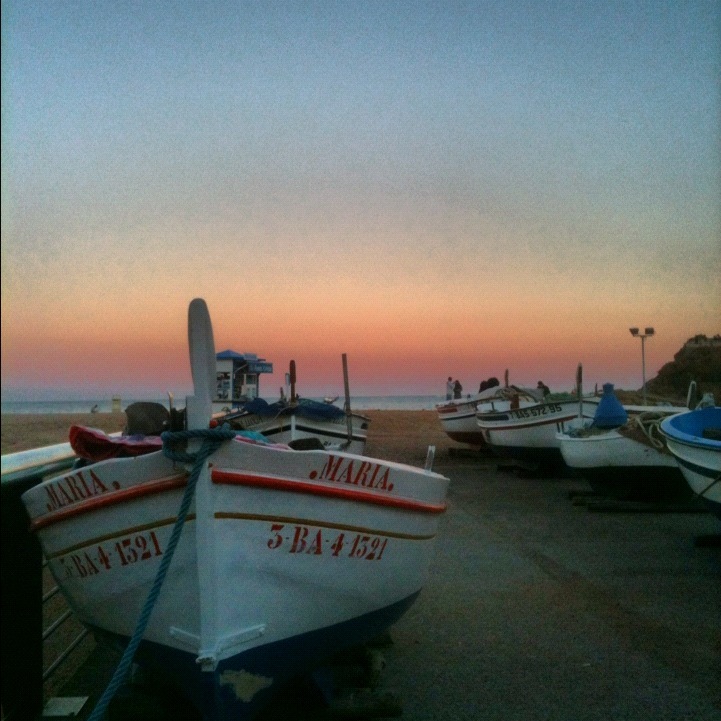 **IST Students - You will see this in Sitges. 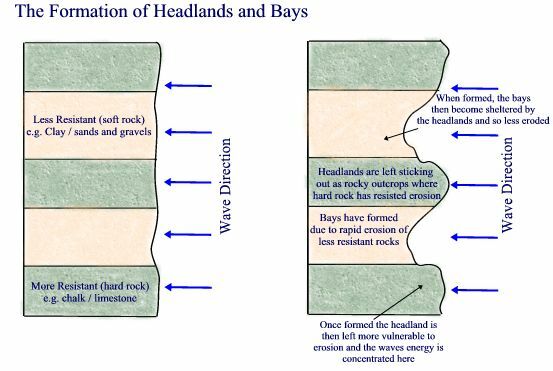 ​Task 1 - use this worksheet, explain how the process of bay and headland formation works. Caves, arches, stacks and stumps are usually found on headlands, where wave refraction is causing erosion on three sides. The waves always look for weaknesses in the headland (cracks and joints). If they find a crack or a joint they will start attacking it. Hydraulic pressure will be the main type of erosion. Overtime the crack may turn into a cave. Slowly the cave will get bigger and cut all the way through the headland, making an arch. As the arch gets bigger the weight of the arch roof gets too great and it collapses, leaving a stack. The stack is then eroded by the sea and weathered from the air leaving a stump. Blowhole: Sometimes the sea may erode through to the top of the headland (following a large crack). If this happens a blowhole is created. Watch the really excellent video to the right hand side. Who would have thought that we could use plasticine to show the process!! Anyone fancy trying this out at home in their sandpit? Task 3 - Create an annotated sketch using the diagrams, YouTube video and description above to explain how caves, arches, stacks & stumps form. Don't forget to add a blowhole too. 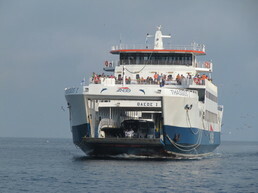 Objective: To find out how waves move material many KM along the coastline. Longshore Drift or LSD is an important process on every beach. It is the process by which material moves along the beach everyday. If you painted a pebble bright pink, left it and came back one week later, the sea would have moved it to a completely different part of the beach. Spend 5 minutes watching Mr Rogers (a very good Geography teacher from Portsmouth, UK) explaining how Longshore Drift works. Task 4 - Design your own diagram to show how LSD works based on what Mr Rogers says and draws. Annotate it with as much detail as possible. Groynes: Groynes are wooden or concrete fences (walls) placed out into the sea to stop longshore drift happening. **IST Students - You'll see these in Sitges! 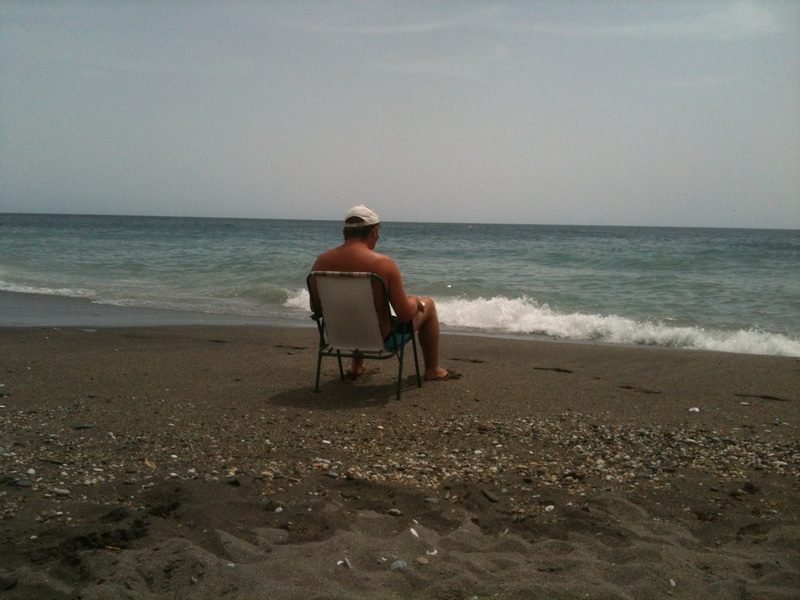 Beach: The beach is the accumulation of sand between the lowest spring tides and the highest spring tides. 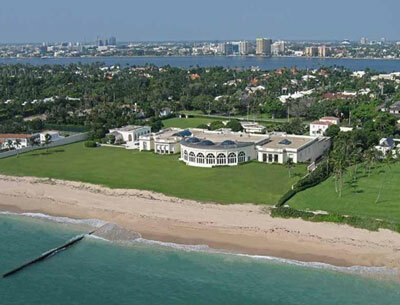 Beaches can be made out of sand, shingle and/or pebbles. 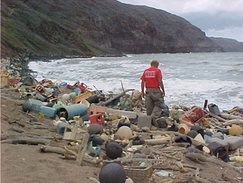 Beaches receive their material from longshore drift, constructive waves, cliff erosion and river discharge. Beaches cane be divided into backshore, offshore and foreshore. The backshore is the area above the normal high tide level, the foreshore is the area in between normal high and low tide and offshore is the area below the normal low tide. Berm: The berm is a ridge (long thin hill) that forms at the top of the beach. It is the highest section of the beach and is basically sand accumulated on the strand line (twigs, litter, seaweed, etc. deposited at high tide). Intertidal zone: The area of land between high tide and low tide. Strand line: The material (seaweed, driftwood) that is deposited by the sea at furthest point of the high tide. 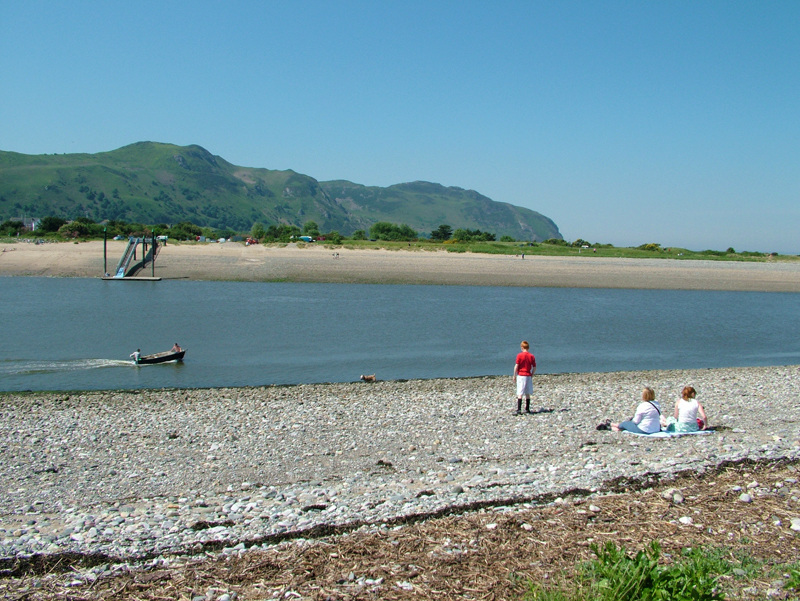 Task 5 - Either using the photo of the beach in Conwy, North Wales or your own beach photo, annotate the key features of the beach and how it formed. If you star in the photo, you will gain extra credit. No dodgy Bermuda shorts though! ﻿﻿Objective: To complete a mini study on the reasons behind spit formation and their features. Task 1 - Watch the two minute explanation video on YouTube to the right. 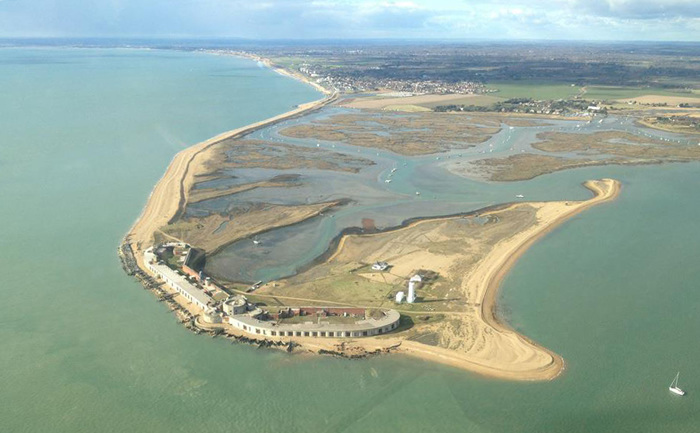 Task 2 - Complete the worksheet below (by hand) labeling the coastal processes leading to the formation of Hurst Spit (UK) as well as its physical features using information from the video task. Objective: To find out how and where sand dunes are formed. Task 1 - Using the video and the embedded presentation to the right and the diagram below, create an A4 fact sheet on the formation and structure of sand dunes. ​....as well as THIS EXCELLENT NEW VIDEO FROM 2018. An example of human uses of a sand dune ecosystem - perhaps using this world famous example. Click here to access your sand dunes worksheet. Complete all tasks set out using all information within. 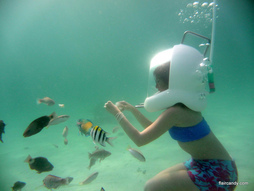 Objective: To discover where and how coral reefs form and the threats posed to them by human activity. Starter: Take a Google 'reefview' tour around Batu Bolong (check out on Google Maps if you've never heard of it before!). If you've never been reef diving before, this is what it looks like. Impressive or what!? However, if that's not enough, click here to be taken to some live webcams of reefs over in the Caribbean. 'Bonaire' is particularly clear! Coral reefs are large underwater structures composed of the skeletons of coral, which are marine invertebrate animals. The coral species that build coral reefs are known as hermatypic or"hard" corals because they extract calcium carbonate from seawater to create a hard, durable exoskeleton that protects their soft, sac-like bodies. Task - Using the worksheet above and the evidence board below, complete all tasks set out on the PDF sheet by hand. 1. What are mangroves and where do they naturally grow? 3. What 'death rate comparison' can be made over their effectiveness after the 2004 Asian Tsunami? 4. Outline what is being done to resolve the problem caused by mangrove removal. 5. 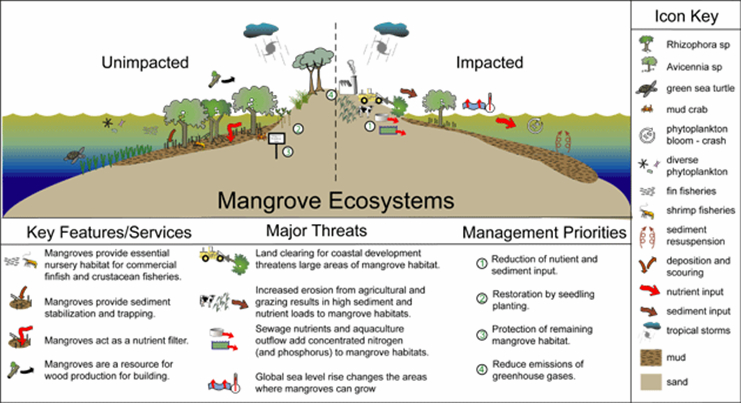 How is the removal of mangroves also linked to coastal erosion? Task 2 - Watch the short video beneath and study the image below. Make notes on further values and threats that you see on the video. Objective: To create an RSA style video using a technique of your choice to show coastal processes (erosional & depositional). RSA videos are those that are manipulated by speeding up, slowing down, time lapse and over dubbed with your voice. You might remember seeing some examples produced by Year 11 students at the International School of Toulouse and Priory School, Portsmouth to the right. These are examples of sped up videos that are over dubbed with narrative showing the changes to the river features on the River Garonne. They are brilliant ways of learning and remembering geographical processes. 3. Deposition - Beaches and/or spits. You can do a traditional RSA like the first two videos or something a little more creative like the video to the right with Plasticine. There is another video above (Headland Erosion by Jasmine) that is more iGCSE in style. Your efforts will be presented to the rest of the world on YouTube and a winner chosen. ﻿Objective: ﻿﻿To find out how humans try to win the ﻿fight with the sea and its erosive power. Starter: To clarify what we learnt last lesson, watch from 8-10 minutes on the coasts video to the right. Then, watch from 10 minutes onward. 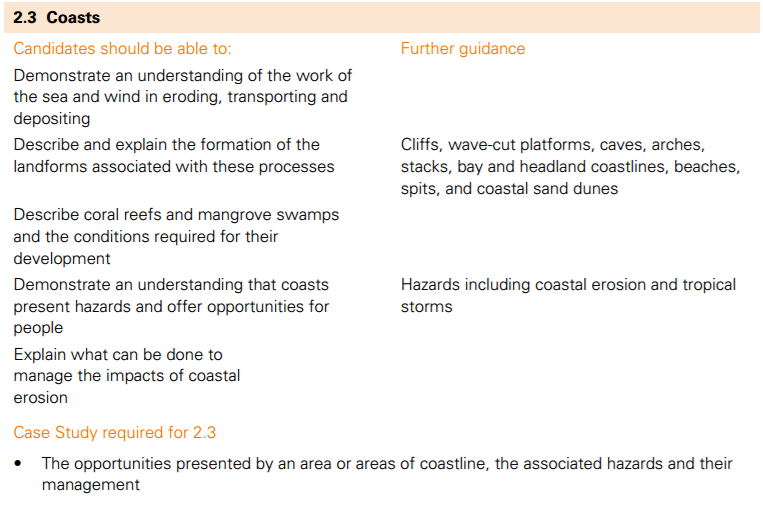 You are going to be putting together a fact sheet on both hard and soft engineering approaches to preventing coastal erosion. Part 2 - Soft engineering approaches - Time for Geography Video link here.